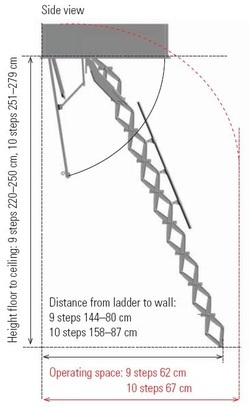 This concertina loft ladder is, in our opinion, one of the easiest on the market to use, no matter what your age! It comes with two large counter-balance springs which control the lowering of the ladder and make it extremely easy when you want to put the ladder away. It also comes with large, deep treads and two protective rubber feet. 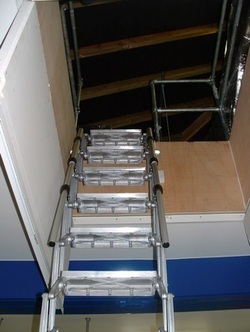 This ladder is ideal for both domestic and commercial properties with restricted access. First choice for "awkward" lofts, rather than a last resort. The ultimate in concertina loft ladders with its ease of use and extra deep treads, it’s hard to compare this ladder to any other. 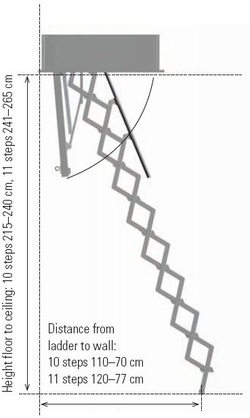 Widely used in commercial and domestic properties with a higher than average ceiling height. Optional telescopic handrails are available for both sides of the ladder, making this ladder a really safe unit to climb.